Menopause often brings a number of uncomfortable symptoms. On top of all of the other changes associated with the end of your period - such as mood swings, low libido, and hot flashes - stress can come on strongly as well. When you're overly stressed, not only does it affect your ability to think rationally, but it can impact your body as well. It's important to understand when your concerns are taking over so that you know how to respond. It may seem tough at first, but it is possible to take charge excessive stress and its emotional side effects. People who suffer from chronic anxiety not only become frequently caught up in upsetting mental cycles, but they can experience physical reactions as well. When certain thoughts build up in your mind, those thoughts can become so troublesome that they can cause muscle tension and pain, restlessness, irritability, paranoia, and difficulty concentrating. It can get in the way of your ability to focus on work or personal matters. You may feel so overwhelmed or trapped in your thought process that you cannot enjoy life. Anxiety will usually continue if it's not treated and can culminate in a serious disorder. 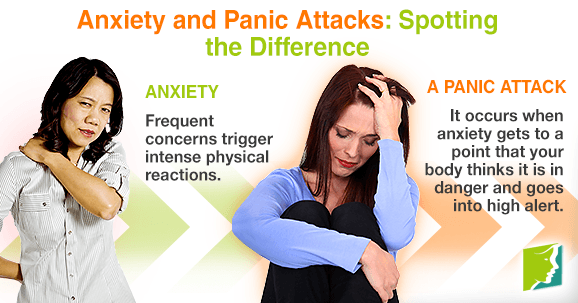 A panic attack occurs when your anxiety levels reach a point in which your body thinks it's in danger and goes into high alert. There is only so much worry the brain can handle before it sends a signal to the body for urgent assistance. Common reactions are sweating, shakiness, dizziness, hot flashes, nausea, increased heart rate, shortness of breath, and tearfulness. During panic attacks, people often feel like they are going crazy with worry. These episodes can be caused by a single stressful event or a build up of minor stressors over time. How Does Menopause Factor in? Stress is often heightened during menopause as a reaction to important physical changes. Estrogen levels significantly decrease, which directly affects brain chemistry. Neurotransmitters - like serotonin, oxytocin, and endorphins - are reduced. These are chemical messengers in the brain that inspire feelings of joy and tranquility. At the same time, the stress hormone cortisol increases, which can encourage anxiety and the occurrence of panic attacks. Meditation is a great way to reduce stress during menopause. It allows you to tame obsessive thoughts, process feelings, and increase calmness. It can be difficult at first, but practicing daily will improve your coping skills in just a few weeks. Try practicing in solitude for 20 minutes per day or finding a local meditation group. You may also want to begin a yoga practice. Yoga sequences incorporate deep breathing and focus that releases stress from your shoulders, hips, and forehead and increases your gamma-aminobutyric acid (GABA) levels, encouraging tranquility. Taking phytoestrogenic herbs - such as soy - to increase your estrogen levels can also be very helpful. You can also try significantly calming herbs, such as lemon balm or valerian root, during episodes or times of acute stress. If your anxiety is extreme, or if none of these treatment options are successful, you should talk to you doctor about others that are available. Anxiety can lead to a variety of unhealthy side effects over time, and panic attacks can be very disruptive to daily life. For more information about anxiety, follow the links below.